Take a free public tour of BMW's automobile plant in Regensburg. 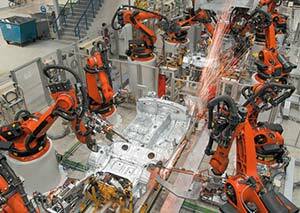 ABOVE AND BELOW RIGHT: Robots spot-weld a BMW Series 1 car in the Regensburg factory's body shop. BELOW LEFT: An aerial view of the plant. Regensburg, Germany's medieval center has earned a place on the UNESCO World Heritage list, but the city has its modern side, too--including a state-of-the-art BMW plant where some 10,000 skilled workers produce the BMW 1 Series, 3 Series, M3, and specialized vehicles such as police cars. Since the factory opened in 1986, more than three million BMWs have emerged from its flexible assembly line. Like other BMW facilities, the Regensburg plant offers tours to groups and individuals. Each tour lasts two to 2.5 hours, and it lets you walk right into the middle of the action: During your visit to the body shop, for example, you'll be surrounded by giant conveyors that lift car bodies into place for automated welding by computer-controlled robots. Other highlights include the "wedding" or "marriage" of engines and car bodies (with a cluster of automatic bolt-drivers rising up to lock the engines into place) and a final-assembly line where cars from different series--many of them customized for individual buyers--are put together one after the other in a remarkable display of logistical efficiency. As cars move along the line, assembly teams ride with them on a moving belt instead of trying to walk and perform assembly tasks at the same time. Conveyors and other devices position car bodies at the most comfortable level for each task. (For example, near the end of the line, where license plates are bolted on, the cars are lifted up so workers don't have to bend down. If you're visiting Regensburg, don't miss the BMW Werk plant tour. For more information, including Web links, go to page 2 of this article. Photos copyright © BMW AG.